Luke Alike is licensed under a Creative Commons Attribution 3.0 Unported License. Permissions beyond the scope of this license may be available. Posted to Flickr on 10 July 2009. Part of the Stormtroopers series. 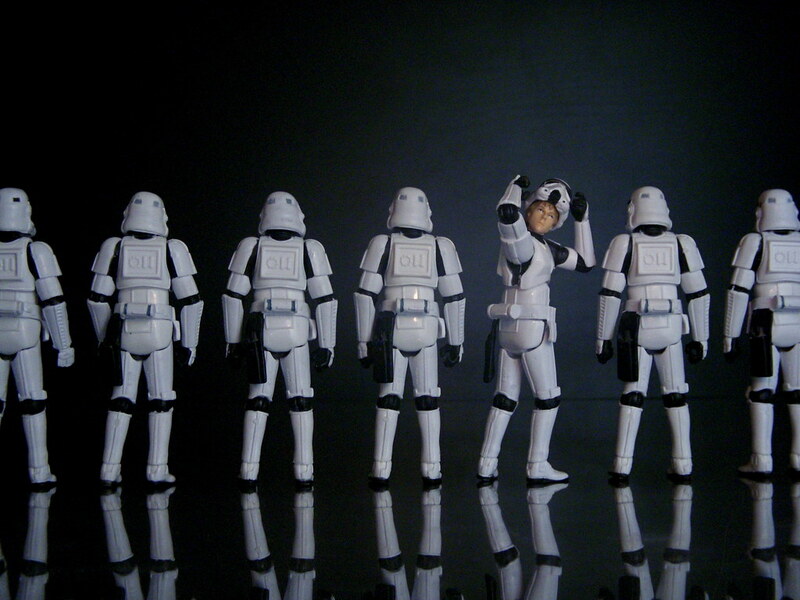 One of these troopers is not like the others …. Photo shot for the Flickr group The Thematorium. 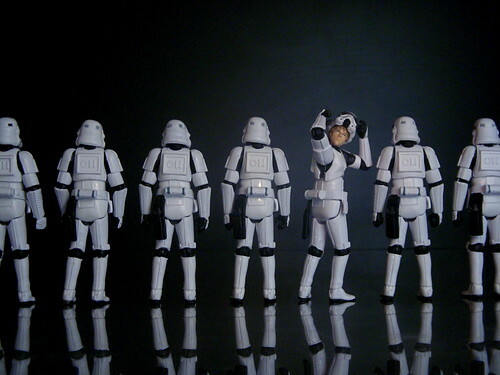 Of course the idea of “a bunch of guys that all look the same” runs through much of my photography, especially my stormtrooper photos, so it was not difficult for me to come up with something about “repetition.” I love repetition. I really love repetition. After this photo was posted it was correctly pointed out to me by several Star Wars fans that Luke should be shorter than the stormtroopers. This photo was posted to Flickr on 10 July 2009. It was one of 500 images featured on Flickr Explore for that day. The last time I checked, it had 11,839 views on Flickr. Luke Skywalker is a farm boy-turned-Jedi Knight in the Star Wars universe. Created by George Lucas and portrayed by Mark Hamill, Luke is a central figure in the original trilogy Star Wars (1977), Star Wars: The Empire Strikes Back (1980), and Star Wars: Return of the Jedi (1983). His story largely involves the redemption of his father, the villainous Darth Vader, by learning the ways of the Jedi and taking the virtuous path his father had abandoned long ago. Armed with an optimist viewpoint, a strong sense of responsibility, and his lightsaber, Luke helps lead the Rebel Alliance against the evil Galactic Empire. Luke Alike by JD Hancock is licensed under a Creative Commons Attribution 3.0 Unported License. Permissions beyond the scope of this license may be available.